If you like Japanese crazy shows like Ultraman and Kamen Riders, if you like racing games since Mario Kart, if you like the funny SD manga style, we might have the preview of the perfect game for you. This weird baby is called Charinko Hero (Bike Hero) and puts some famous Japanese TV heroes on tricycles for a fighting race. There are amny characters and you an seemingly beat your opponents by shooting tires (!). It seems very entertaining, hopefully Banpresto will deliver a polished title and we might get some real fun, especially the Japan fans among us. Is Microsoft trying to buy Nintendo against their will ? Here are two statements from IGN. The first one comes from their n-query, their mailbag, the other one from a business news. - "Apparently Microsoft, more than Nintendo, is interested in some kind of partnership." - "Nintendo Co. Ltd. today announced that it had successfully repurchased 7.95 million (or about 5.6% shares outstanding) of its own stock. The company spent $728 million in the re-acquisition. The move, which was set into motion last June, was made by Nintendo in an attempt to ward off the possibility of a hostile takeover by another company." Could there be a link ? An awful rumor has been spreading about a partnership between Microsoft and Nintendo for the next generation consoles but if the truth was merely that Microsoft is trying to buy a part of Nintendo's stocks to force them to develop games on their crap system ? That's really how it sounds in the news, who else could have the power to attempt such a "hostile takeover" ? Besides a similar move from Microsoft toward Nintendo, which failed, was reported last year in a book. This is the top for last week, it's no surprise: Wario World arrived at the number 1 spot. Sorry for the lack of updates lately, but I can't connect as easily as I would like. It should improve next month though. The new Japanese ranking has been updated in Japan Weekly, nothing relevant this week. The planning has been updated too with only a few changes and a release date for Harvest Moon. The ranking of the best sales in Japan have been updated ! Check Japan Weekly. Officially, the very first release of the game is set for tomorrow in Europe. Samurai Nintendo however got the game earlier and propose you already the full review of this new Nintendo title. Back again, this time for the week ending on June 14. Acclaim bought the rights to adapt 2 comics last week. The first deal, with Archangel Studios, will bring to GameCube The Red Star, a science fiction story based on an imaginary russian empire. The second one, with DC Comics, is 100 Bullets. Both games are scheduled for a 2004 release. I received Wario World today. I wanted to give my first impressions before the test, but I don't really have time now. I will, tomorrow. Well, ok, briefly, the game is not a blast: it's very easy, the graphics are poor and it seems very short. There are 4 worlds, 2 levels and 3 bosses in each, so only 8 levels, and I don't expect any big surprise like plenty of secret levels. Besides, it's very easy to fully complete every level, I did it the first time almost in the first world. However, the play mechanics are pretty cool, it feels like a 2D platform game with some space around or like a restrained 3D game. Wario has some cool moves and attacks, and there are some nice platform elements. However everything is much too easy (for me at least, am I that good ?? Nope.) and it seems targeted to a young audience, you can't even die by falling, never ! The graphics also are really going to disappoint people, they look totally outdated, hardly textured, it could have been made on Nintendo 64. I'm having fun though, but I didn't pay for the game, so I don't mind finishing it in 1 or 2 days and that's what I'm likely to do if I continue at this pace. The game is compatible with the Game Boy Advance by the way, to download some games from Wario Ware. The game itself takes 10 memory block. The official release date is set on Friday 20 in Europe, the rest of the world, for once, is coming later. The ranking of the best selling GameCube games in Japan is here for our weekly rendez-vous. Nothing really exciting this week though. A new feature has been added, providing a detailed list of the games reviews and previews in Samurai Nintendo. It doesn't have a place of its own yet, but you can already check it. No Spaceworld. It was predictable, Nintendo announced there won't be a Spaceworld this year again. The Spaceworld, ex-Shoshinkai, is not such a regular event, but it seems Nintendo won't hold their very own show until things get better for them in the home console market. Too bad for those who expected some good surprises after a rather disappointing E3. If you missed these excellent games or if you are just so damn rich... you will have to import it ! Indeed, so far it seems it's not coming in the West. Otherwise, buy the games separately, make the box yourself and just forget about the goodies ! To be released on August 5. Mario 128 and the ECTS. A rumor spreading on the Net has it that the so mysterious and long delayed title will be presented for the first time at the ECTS, the biggest video games show in Europe. Now, the question is: is it just the dream of an English fan boy or does this rumor really have a reliable source ? Acclaim. Acclaim's chairman and co-founder Gregory Fischbach stepped down. Is Acclaim going to keep its creative touch ? The company has been focusing on original titles which unfortunately didn't always reach the standard quality levels. In Samurai Nintendo, you'll find the reviews of the following Acclaim's productions (score in brackets): 18 Wheeler (6), Dave Mirra 2 (8), Aggressive Inline (9), Turok Evolution (7) and Vexx (8). Yep, we like Acclaim for their original licenses and pretty good games. They have more creativity, and sometimes more talent, than tasteless companies such as 3DO, Activision or Electronic Arts, and we sincerely hope they'll keep it. Camelot at work. Camelot explained in a Japanese magazine some time ago that they are focusing their efforts on Mario Golf and Mario Tennis only, and that there is no Golden Sun planned for GameCube at the moment. GameCube demo disk. A GameCube demo disk with playable versions of Viewtiful Joe, Splinter Cell, Billy Hatcher, Soul Calibur II and Sonic Adventure DX has been released last month in Japan and USA (and Canada for some). No Super Monkey Ball 3. This is a rather old news, but it's worth reminding. Soon after the E3, Sega officially denied that a third Monkey Ball game is on the making. It was heard before the E3, and reported here, that such a game was in the work with the name Banana Crazy and a possible LAN connection. 1.1 million GBA SP. That's the number of units sold in USA since its release. I could provide it on a regular basis, it will depend on the readers' interest, here's the top 20 of the best selling GameCube games in the United Kingdom. The preview has been updated with 7 new screenshots and some official information. A date for Europe has yet to be confirmed. I heard of a highly improbable release on the 27th of this month, hmm, yeah, highly improbable. 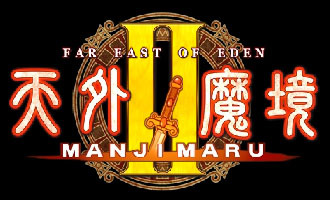 Far East of Eden II coming to GameCube ! It's our partner for this month and we're proud of it: True Crime - Streets of L.A. has everything to become a major hit on GameCube. It looks good and plays in a similar way as GTA except that in this one you are the cop, and not the mob. Yep, it's better to have some morale (well, just a little is enough). Click the banner to know more ! The planning has been updated in Japan Weekly with the exact release dates of Lupin III, Doraemon, Gero Gero King DX, Charinko Hero, Dragon Drive and... Pokemon Channel ! July is really a hot month with 13 games announced, wow. Kirby, Pokemon, F-Zero, Lupin, Doraemon, Bomberman: all this in July. And, as you probably know, Final Fantasy Crystal Chronicles has been pushed back till August 8. The best sales for last week have been updated in Japan Weekly and we added a brand new poll with some of the main games of the E3 to choose from.